The spectacular aerial view of the exotic island sanctuary of Vanuatu offered by leading tourism and flight company Vanuatu Helicopters can be used for a multitude of commercial services as well as recreational ones. While much of the company’s business comes from those who are looking to capture the unforgettable spectacles of Vanuatu, such as the lush jungle, golden sandy beaches and awe-inspiring volcanoes that are just a few of the wonders to behold from the air, Vanuatu Helicopters is more than ready to assist with a wide variety of other, more commercial services. The company uses its helicopters in a manner both effective and versatile, utilizing the unique opportunities an aerial perspective offers for all types of industries. “Our machines are well suited to all photography and filming jobs. We have wide experience in land surveying and feature film work,” says Andy Martin, Ground and Flight Operations Manager for Vanuatu Helicopters. Film and television work done by Vanuatu Helicopters includes filming work for the BBC, television program 60 Minutes, and even big-budget film work such as the 2012 Chinese comedy/action film Chinese Zodiac, starring Jackie Chan! The birds-eye view that Vanuatu Helicopters can provide is also useful for advertising and marketing photography, an advantage that real-estate companies and developers have found particularly advantageous. 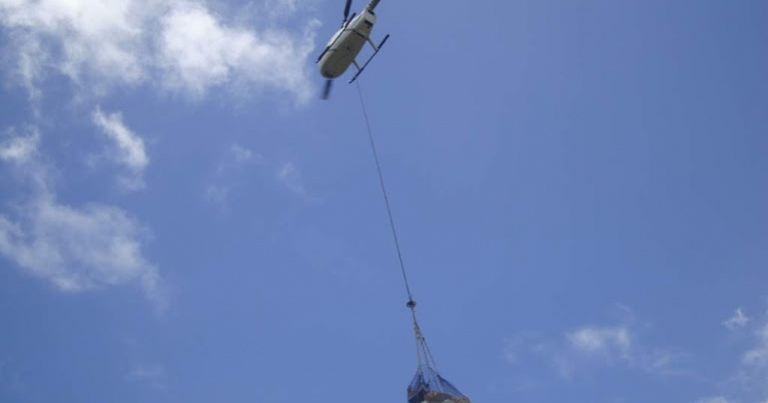 Several helicopters in the fleet are also useful as a means of cargo transportation, particularly when heavy equipment needs to be transferred over water, rough terrain or high altitudes. “Our Robinson R66 Turbine Helicopter is equipped for external sling load applications. We have been operating our R66 in Vanuatu for the past six years, which has proved excellent as an external sling load platform,” says Andy. The R66 can support loads of up to 450 kilograms and features a remote-operated hook at the end of a 100-foot line, making it ideal for construction in remote areas. And finally, medical evacuations are perhaps the most crucial service Vanuatu Helicopters can provide, for a swift response to an injury can make all the difference in an emergency. Vanuatu Helicopters have provided this service many times in the past and can deliver a quick and professional evacuation from any island in Vanuatu to an advanced medical facility in Port Vila or Santo. So, for those looking for a higher perspective on the grand sights of Vanuatu, whether for business or pleasure, Vanuatu Helicopters can provide! Winners of the Vanuatu Tourism Award 2014-2015 and 2017-2018, Vanuatu Helicopters are located at the sea wall in central Port Vila and are the perfect way for travellers to Vanuatu to get a bird’s-eye view of the many extraordinary vistas that the island paradise of Vanuatu has to offer! To book your aerial Vanuatu adventure now, or to enquire about their commercial services, click here! New Zealand-based telecommunications company Ufone NZ buy out supplier and installer of NEC telephone systems Maxitel.